Natural systems are diverse and include a variety of plants, animals, microbes and fungi. This diversity is considered a key to their resilience and stability. Intercrops are one way to bring some of this diversity to agro-ecosystem structures, accessing different portions of the soil volume. Overyielding occurs when the intercrop yields better than the two crops would have if they were grown separately. Crops that benefit each other by providing physical supports for climbing, improving airflow or reducing disease transfer may increase the intercrop yield. Crops that avoid competition by using resources differently, especially at different times, are likely to overyield. Planting legumes such as peas, lentils, chickpea, sweet clover and alfalfa with cereals such as wheat, barley and oats can be effective in improving fertility. The cereal takes up most of the available soil nitrogen, which pushes the legume to form an association with rhizobium bacteria to fix nitrogen. When intercropped with legumes, wheat may produce more protein, and forage might be more nutritious. 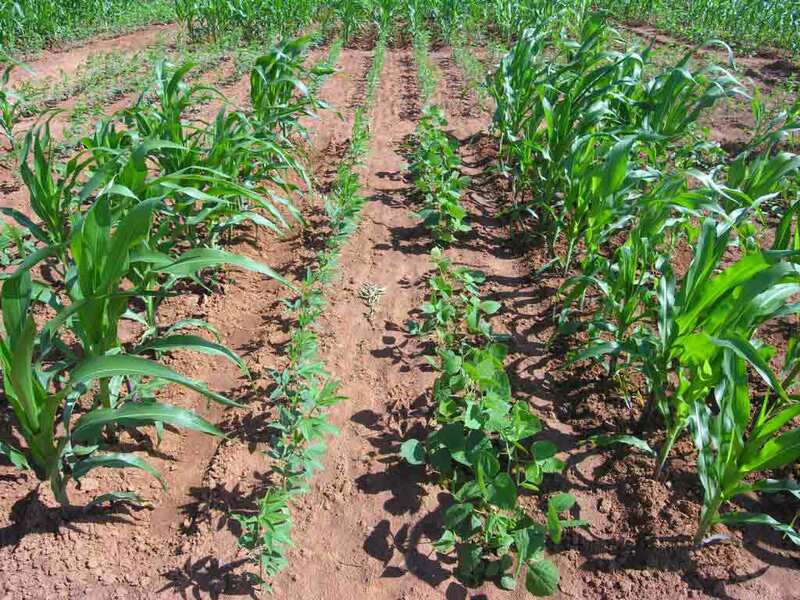 Intercropping is an important method for establishing green manures. Sweet clover, red clover and alfalfa are often established by under-seeding them with cereal crops. This provides effective weed control in the young legumes and some nutrient boost to the cereal. Cereals and legumes are ideal green manures. The legume provides nitrogen, but decomposes rapidly. The cereal decomposes more slowly, providing organic matter to the soil for longer. Intercrops are often less weedy. Planting a mixture of crops can fill more ecological niches, providing fewer opportunities and resources for weeds. Flax, field peas and lentils often compete poorly against weeds, especially early in the season when their growth may be slow. Planting cereals with early vigour among the weaker crops can reduce weed pressures. 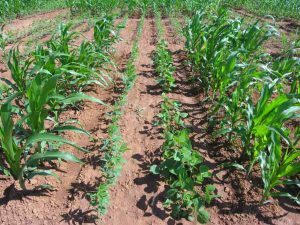 Intercropping can make harvest easier. For instance, adding semi-leafless peas to leafy peas reduces lodging. Planting cereals with lentils can allow the lentil to climb the cereal and keep lower pods out of the soil. Flax, with its fibrous stems, can be a difficult crop to harvest. Intercropping wheat with flax can ease cutting. Wheat can also hold the flax in the swath. For delicate seeds, such as peas, having additional material from an intercrop can buffer them as they pass through the combine, augers and other gear and may reduce damage and improve quality. Many insects find their host plant by smell. The addition of a second crop in the field can disguise the scent for searching insects. Intercropping canola with barley reduces flea beetle and diamondback moth damage to the canola. Similarly, intercropping mustard with barley or wheat reduces problems with these insects. Intercrops can change the environment within the stand. For instance, chickpeas are vulnerable to ascochyta blight. Intercropping chickpeas with flax alters the crop canopy and improves airflow. This reduces the spread of disease in the chickpeas. Intercrops can be used to help compensate for variable weather conditions. For instance, in a mixture of sweet clover and red clover, the sweet clover performs better under dry conditions or on the knolls, while the red clover does better in wetter conditions and in the valleys. Seeding them together is a form of weather insurance. This can be an important tool in an uncertain climate. Intercrops can provide economic benefits due to overyielding or by protecting high value crops from weeds, diseases and insects. They can also provide income stability by mixing crops that perform well in different conditions. Intercropping increases the crops per acre, which again increases income stability. Intercrops have the potential to increase cropping diversity, reduce weeds, insect pests and diseases, and improve yields. They offer potential agro-ecosystem advantages but because they are more complex, they require more management.